We all love a good sequel—if the prequel is just right. Not too many artists in the rap industry can stomach or put out an epic sequel that will leave a lasting impression on the fan base they built. With an artist such as Eminem, who knew one of rap’s “game changers” would release a sequel to a record that helped build his empire in the rap world? The year was 2000 when Marshall Mathers released his debut self titled CD that you either grew to love or hate. 13 years later, we are in the same boat trying to figure out if we will love or hate the new tracks that Eminem has formed to release on, The Marshall Mathers LP 2. 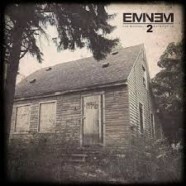 In great Marshall Mathers style, there is a story to be told and this CD provides no exception as the 20 track album will leave you streaming to either get to the next song or skip the current song. One of my favorite tracks on the prequel was “Cleaning out My Closet,” so I was thoroughly excited to listen to “Headlights.” The song describes Eminem making a truce with his mother and sending apologies her way as he apologizes for his wrong doings as a young Marshall Mathers. Fellow artist Kendrick Lamar lends his voice to the track “Love Game,” in which Eminem is ranting as usual. We all know that Eminem isn’t one to hold his tongue or feelings and this is especially true in the track “Baby.” The rapper pulls no punches and his “anger rapping” style is at its best on this track where he puts his feelings on the mic of everyone in the industry he has a grudge against. The album starts off dark, then switches to happy and then dark again. It’s a true melodramatic tale at its finest. If you’re familiar with the producer of “99 Problems,” Rick Rubin, then you will understand the waves this album will take you through. Rubin’s hard-hitting production style is a stage play in itself. With tracks such as “Rhyme or Reason” and “So Far,” it’s undeniable that the pair was meant to be a music match made in heaven. Eminem fans will appreciate this album undoubtedly. However, the new school of rap fans will have to let this album marinate in their music mindset to truly understand the flow and style of Eminem. Waiting 13 years to release a sequel takes a lot of heart and a “no nonsense” attitude. Eminem penned and released this album just in time to show who the champ in the game is. Marshall Mathers LP 2 brings a familiar sound and vibe that will resonate with you if you are an Eminem fan. The album is lengthy but once you get through the first five tracks, you’ll understand exactly who Marshall Mathers is and why this sequel was well needed.